Yes, it's sunburn weather again. Seems like it's been very wet recently. I got the September rainfall figures from Steen in Patong (from whose data I made the Phuket Rainfall Averages) and September was wetter than the average. And now we enter October, which is the wettest month of the year (on average) although we expect the seasonal SW monsoon winds to stop blowing sometime in the coming weeks. Despite the blue skies, the sea was still looking rough. 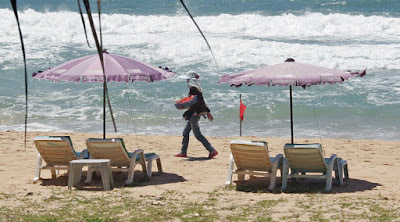 This year has been quite bad for drownings around Phuket. Blue skies and holidays do not mean the sea is safe for swimming. 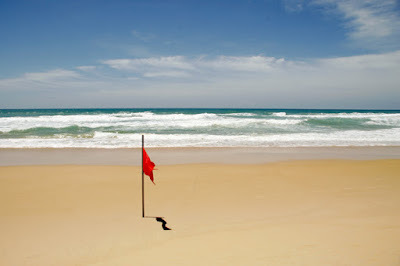 Red flags are not there to decorate the beach. Please take care at the beaches during the low season. High season is on the way, the weather will be changing soon, but at the moment the wind is steady from the west. A steady wind is manageable for dive boats. People said it was a bit bouncy the last 2 days, but nice visibility in the water. On Tuesday our first liveaboard customers of the season are heading out to the Similan Islands. At this time of year it's a bit hit and miss, but things are looking good right now.